The Godfather of Christian Mysticism? In some ways we can think of Dionysius the Areopagite as the Godfather of Christian mysticism. The strands of mystical theology had been there for some time, running through the gospel of John, the Cappadocian Fathers and others, but Dionysius is the first to formulate an explicitly Mystical Theology. Still, Dionysius is something of a mysterious figure. He adopted the pseudonym of one of Paul’s converts in Athens as described in the New Testament, but he was most certainly a Christian mystic from the 5th century, most likely a Syrian monk. 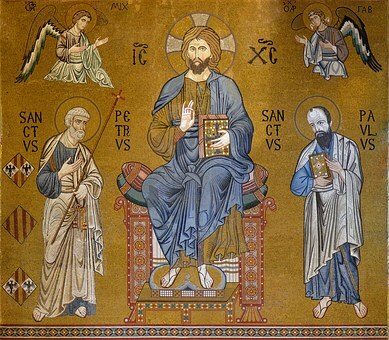 For centuries, though, he was considered authoritative since classical and medieval theologians assumed his teachings stretched back to the early church. His is the first fully “mystical” theology in the Christian tradition and influences many of the later mystics, including the 13th century English language classic “The Cloud of Unknowing” and modern mystics like Thomas Merton and Fr. Thomas Keating. Download Contemplative Light's Beginner's Guide to the Christian Mystics! In his writing simply titled “Mystical Theology,” he describes the divine darkness of God that is beyond all language and concept, and within which the divine union becomes possible. He describes the apophatic or mysterious attribute of God, which is beyond the human capacity to describe or name. For Dionysius, the whole cosmos is called to one vast ecstasy. God gives of himself ecstatically in the creative act, and the created return to him ecstatically. His is a vision of mutual ecstatic giving over in divine love. This is the unity we achieve in Christ, which is never for us alone, but in dynamic relationship to others, to creation, and to God. For Dionysius, the return to God is not a dissolving, but a divine union, a flowering and a perfection through the ongoing generosity and ecstasy of divine love. At the summit of the spirit lies this union with God, as we are drawn up. Mystical theology for him is the culmination of cataphatic and apophatic theology. It is a pure grace, beyond all division, intelligence, will, materiality, and sense. The cosmic love of God is by definition self-transcendent. It is in this space that we rest in God and experience the ultimate divine transformation. GET OUR FREE ILLUSTRATED GUIDE TO THE CHRISTIAN MYSTICS!